There is a pretty neat correlation there in the last 90 years, and then in the second graph they take that correlation back to 3,500BC, back when the Funnelbeaker culture was making nice pots in the same area. This same odd coincidence of the sun and rainfall patterns was also found by researchers in Chile, China and Australian and Indonesia. Low solar activity tends to occur at the same time as the winter jet stream in the North Atlantic gets blocked. And solar activity seems to affect Earth’s atmospheric pressure. None of these things occurs in climate models. Naturally, TSI itself is probably not the driver, it is just a marker for some other effect operating within and from the sun itself. (Read more on the possible mechanisms below). It’s another reminder of what the global climate models don’t know, and explains why they are so terrible at predicting rain. As David Evans outlined there are as many as seven different ways the sun could affect our cloud cover (and thus in turn the rainfall). It could also be the solar magnetic effect on cosmic rays, or through plantkon that generate aerosols that seed clouds, etc etc. There are interplanetary electric fields, there is the dynamic ever shifting solar wind, and who knows, meteoric dust which also changes with solar cycles. The researchers talk about the solar top down mechanism, which involves the cyclic UV shifts that appear to occur in every solar cycle, and also about cosmic rays. But Stephen Wilde has long ago developed a theory about UV acting on the stratosphere and mesosphere that changes the jet stream patterns, which lays out a mechanism in more detail. One amplifying feedback proposed by model studies is the so-called solar top-down mechanism (Gray et al., 2010; Haigh, 1996; Ineson et al., 2011; Lockwood, 2012). 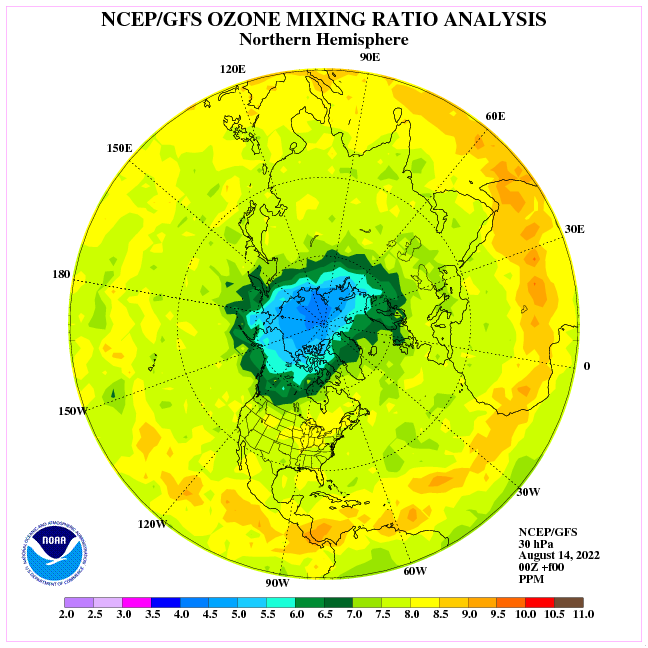 Larger changes in solar UV emissions influence stratospheric ozone concentration, heating and circulation and, consequently, strength and stability of the polar vortex. 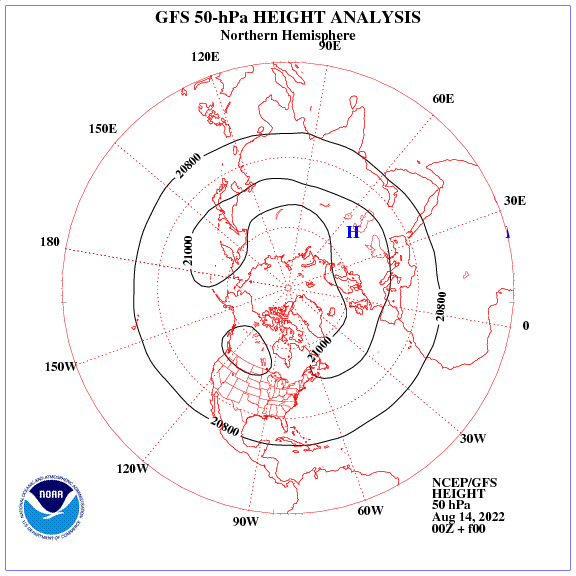 These disturbances are expected to communicate downwards to the troposphere via a chain of processes that is still under investigation to modify position and strength of the midlatitude storm tracks mainly over the North Atlantic and Europe (Gray et al., 2010; Haigh, 1996; Ineson et al., 2011; Lockwood, 2012). Under further consideration are the effects of energetic particles from the Sun and galactic cosmic rays on cloud cover and precipitation. The only lag or delay mentioned in this paper is a 3 year gap after TSI peaks, not the key pattern of a delay of a solar cycle which would fit in with the work David Evans has done. Czymzik, M., Muscheler, R. and Brauer, A. 2016. Solar modulation of flood frequency in central Europe during spring and summer on inter-annual to multi-centennial timescales. Climate of the Past 12: 799-805. So what would the greenies do and say when all the world is powered by renewables and the floods and storms continue? It will all be lollipops and rainbows…there will be some new branch of the warmist religion pop up to explain it all…. The Greenies will say we would need to fund CSIRO and other research organizations around the world to develop ways to extract CO2 from the atmosphere. How is it actually possible for someone to be so ignorant and stupid as Bandt? He is neither ignorant or stupid. He is just following the fame and the money that goes with it. No Alfred, he is!! both ignorant and stupid, but as you add following the fame(I would call it attention) and money. Easy. Fail maths and science at school. Look for a job with high pay and adequate security …. ah, politix. Mr Bandt won’t like this, but may be forced into a decent debate. “But State Treasurer Tom Koutsantonis said a lack of profitability forced the station to close. He said unless a private operator went it alone, even a temporary reopening would not happen. “This is a silly, stupid idea by the Liberal Party, they haven’t thought this through,” he said. I suspect there might be quite a brawl over this. And they like to paint the Libs as only having short-term vision! Perhaps a link to the paper would be helpful in the article ! CO2 release from ocean surface produces more water vapour in atmosphere. So increase in solar activity means larger water holding capacity of atmosphere not related directly to atmospheric temperature, only ocean surface temperature. Reduction of solar activity suddenly reduces atmospheric water vapour resulting in lots cloud and rain. This can be simulated in micro using CO2 in lab eg glass house. 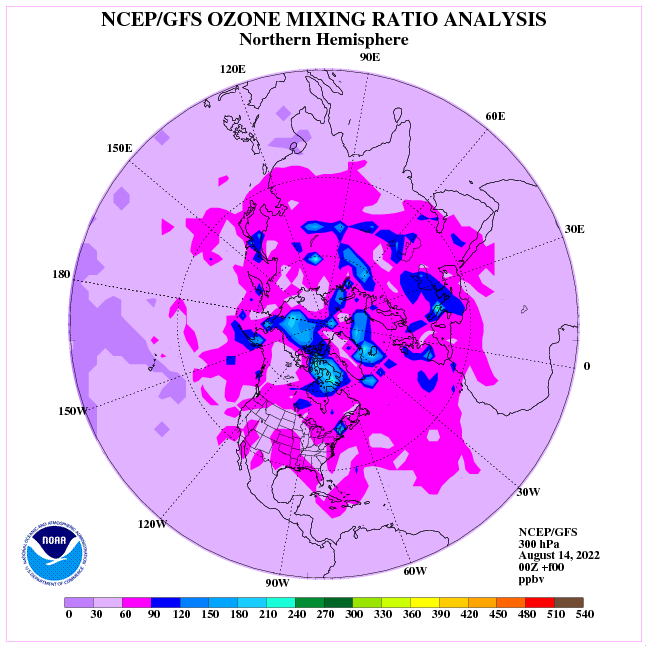 CO2 plays a major role in our weather patterns. However, whatever it does, is always driven by the activity of the Sun. CO2′s action as a greenhouse gas is extremely minor. Such greenhouse action can be ignored in any climate change model. However, it is a solvent (it ionizes water) and as such it will cause more evaporation from our oceans and forests by reducing surface tension at the same temperature. So greater solar activity will result in more evaporation simply because more CO2 is released from ocean or leaf surfaces. Lower solar activity allows water droplets to cohere as water ions become water molecules. Hence rapid cloud formation and increased rainfall. 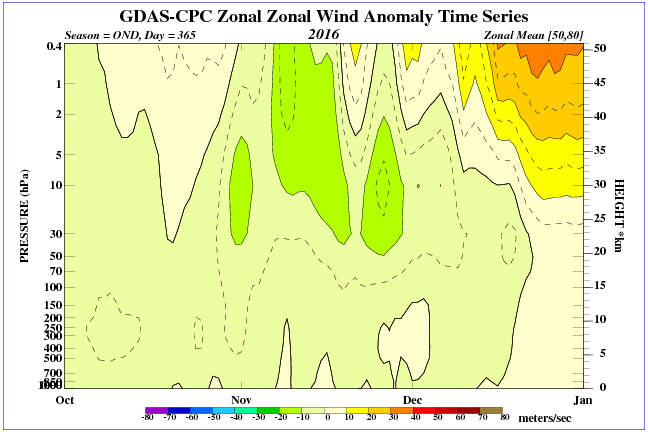 We current know this process as El Nino and La Nina. Sorry Pete there are no references. Either I am right or wrong. Its easily provable on a micro level. Its one of the main drivers of cloud formation. I do have my own experiments running, making stuff. Have had for many years. Not interested in university rent seekers. I’m trying to get my head around a double covalent bond reacting with a covalent bond ionising the covalent bond….where do the electrons go again? Water goes to hydronium and hydroxide surrounded by CO2. Will not work for very cold water, so no evaporation. Go to Arctic or antarctic and measure same. A fall in CO2 below 150ppm would not be good. We would reach an ELE point. We passed the tipping point. Models show that that it can’t be anything else but the previous generations emissions. Go on. Red thumb me but my Big Oil check hasn’t come through and I’m changing tact. Big Grant, here I come! “The first man I saw … had been eight Years on a Project for extracting Sunbeams out of Cucumbers, which were to be put into Vials hermetically Sealed, and let out to warm the Air in raw inclement Summers.” Swift, Gulliver’s Travels. I think that pretty much describes the career path of most “climate scientists”. The second figure is so jumbled by variation that it is hard to see any relationship. And, an R-squared of 0.16? That means that their model does not explain 84% of the variation in flood frequency. With this high level of variability and poor level of explaining the variation, their models appear to be useless. Perhaps their models/graphs are worse than useless if they fool people into believing they can predict anything. I say this somewhat sarcastically (but only somewhat), but that’s still a better correlation that climate scientists get on their proxy temperature reconstructions. Please, you should never allow rational thought to interfere with with a good scare story. Do you realise, just how many all night smoking sessions are required, to come up with a good scare story? From the original paper the correlation is not derived by linear regression methods. Flood layer frequency and solar activity. (a) Flood layers in Ammersee sediment core AS10prox. (b) Flood layer frequency (30-year moving window) and reconstructed total solar irradiance (difference to the value of the Davos Physical Meteorological Observatory (PMOD) composite during the solar cycle minimum in AD1986) (Steinhilber et al., 2012). (c) Floodlayer frequency (30-year moving window) and 14C production rate (Muscheler et al., 2007). Gray lines indicate the standard deviation of the smoothed food layer record. Correlations were calculated using a random-phase test (Ebisuzaki, 1997). Cross-wavelet analysis reveals regions in two time series with common high spectral power and provides information on the phase relationship (Grinsted et al., 2004). The wavelets were produced using a Morlet mother wavelet. Signifcance levels were calculated against a red noise spectrum (Grinsted et al., 2004). Before the analyses, all data sets were standardized (zero mean, standard deviation). Correlation coeffcients and signifcance levels were calculated using a non-parametric random-phase test (Ebisuzaki,1997). This test is designed for serially correlated time series and, thus, takes into account the effects of smoothing and detrending. It is based on the creation of (here 10000) random time series that have an identical frequency spectrum to the original data series A but randomly differ in the phase of each frequency. To test the signifcance of the correlation between A and B, A is then replaced with these random surrogates, and the probability distribution of the correlations that may occur by chance is calculated (Ebisuzaki, 1997). As I only understand some statistics (enough to get me into serious trouble), I would however ask, as they have used non-linear methods here are R-squared values of any relevance in determining significance? Linear models offer good correlation when the effect is linear, otherwise they should be avoided like the plague. The entire “cherry picking” debate is the result of choosing base periods that permit the researcher consciously or unconsciously to determine the sign of the trend. The climategate email discussion about getting rid of the Medieval Warm Period is due to the fact that by extending the data to the MWP a statistician can obtain either a negative (cooling) trend or zero trend. By beginning the analysis at the “peak” of the Little Ice Age the “team” guaranteed a positive (warming) trend. The same goes for using the early seventies as a start period, the planet has warmed, but extending the start back to the mid-twenties would create a no-trend correlation. Beginning in the Early Holocene results in a cooling trend since we are still considerably cooler than that period which was the warmest in the last 10,000 years, followed by the Minoan, Roman, Medieval and present in descending order. But jump back 15,000 years and the “trend” is strongly positive. Jump back 2,000,000 years and the sign is negative. Linear trends and time series are profoundly deceptive combinations, or can be. Because of that other means of seeking patterns is a good decision. The r values are small because there is a small linear trend. The p value gives you an indication of correlation, that when one is below the trend that the other is also is not just a coincident. Less than 0.01 means that they are very likely to be correlated. My understanding of the stats stops there but you can see that there is a very high correlation. Its not just random noise that looks a bit similar in the two plots. If the sun has no influence on climate, why aren’t all the other planets like Earth? If all it takes to be a warm, wet planet is enough CO2 to act as a blanket in the atmosphere, trapping the heat underneath, then all we need to terraform any place is a giant carbon Alka-Seltzer and some water. The scientists could test that theory by shooting a giant carbon pill into one of Jupiter’s moons, yes? If large parts of what IS affecting our climate are left out of the models, then what the models produce is just cacophony and not-so-pretty lines, or a child’s spirograph drawing. I was seriously told, by one earnest young woman, that the sun has no influence on climate. Her rationale was that we still had a climate at night. Mind you, I did notice that she had problems with her concentration and her ability to focus. I might convert to being a believer – their existence seems to be so … pleasent. Mari the atmosphere of Venus is mostly carbon dioxide (96.5% by volume) so they are already aware of the disconnection. Its hot, but that has nothing to do with CO2 and everything to do with pressure. Two factors there. One, Venus has lots of volcanoes. Two, closer to the Sun being the main factor. It’s that simple. You need to move away from Venus’s hot ground level where the CO2 ‘air’ has an atmospheric pressure 90 times that of earth. Move up through Venusian sulfur clouds to where the atmosphere pressure is the same as ground level on Earth, guess what? The temperature there is approximately the same as Earth’s ground level! Mind you its still not nice there, as its the sulfuric acid and sulfur dioxide layer of Venus’s atmosphere. Floating above the inferno in satellite cities is still some way off, whereas Mars is a closer option. Something to do with length of day and its easier to terraform a cool planet than a hot one. Shooting a giant carbon pill into Jupiter’s moon, I don’t think Al Gore will be keen on that! Agreed but why not send a “giant dill” instead, Al Gore that is. Pill, a tedious or unpleasant person. I don’t care what Mr Gore may like about my idea. It makes as much sense as any of his ideas! If it worked they could all move there and leave us be. Done titan has a Nitrogen + 16000 ppm methane atmosphere with a GW potential of 6.5 surely it’s monstrously hot there right?…. Um Yes that’s right it’s 94 deg….. K (-172 Deg C). Oops could that be because the atmospheric pressure at the surface is 1/7th of earth and it’s at around 5 au (5 x the distance of earth) receiving solar energy of 1/25th that of earth? The surface temperature is a product of the energy available at the surface and the density of the atmosphere simply because thermal energy has to partition between kinetic and potential energy. Any column of atmosphere heated at the bottom must exhibit a lapse rate dependent on gravity. Of course nearby is Jupiter with an estimated surface temperature of 10,000K at the point where the compressed hydrogen becomes a liquid. Ironically because of atmospheric compression due to gravity, something that apparently doesn’t happen on earth according to Anthony Watts. I’ve tried to get that pressure aspect across at Anthony’s site but to no avail. The means whereby simple conduction and convection involving the entire mass of an atmosphere can give rise to the higher surface temperature without needing to consider radiation at all should be more widely considered. I’ve submitted a short essay on that point to Jo for her consideration. First thing you need to understand is CO2 does not act like a blanket trapping heat at some unspecified height and depth in the atmosphere, second the “carbon pill” approach has already been done on a Star Trek movie and it worked a treat. In flat Australia that would be right, but are the floods in Southern Germnay indicative of rain or snow melt in the high alps? In Europe the pattern is always the same, the transition from a warm dry phase to a cool wet climate involves the Arctic Oscillation. If the AO remains negative for the next five months then floods can be expected at some point, but the standout will be the freezing conditions increasing mass balance in the Alps. I had a look at the SOI for Australia, noticed it had been quite low and trsnaitioned upwards sharply just recently. Conditions should remain wet because of the Indian Ocean Dipole, this from BoM. Yes, dramatic but is effect cause? With the high latitudes in Europe (Melbourne is in Libya), you would expect all these things to vary together and TSI more dramatic perhaps than in the strongly water buffered tropical regions. The strong correlation in discussion is between rain and TSI and I guess the point is that CO2 has nothing to do with it. The sun is the strongest generator of weather changes, even very short term in a small area. Quelle surprise. CO2 is not. The correlation between CO2 and temperature does not existaccording to the landmark talk in Hamburg by the impressive Dr. Salby . He goes so far as to say they are CO2 and temperature are not related. (1:03:20+). He was immediately fired by Macquarie University, his credit cards cancelled and his return air tickets, clearly a martyr to the truth. In Australia we have a law against freedom of speech or even comment. Clearly scientific dissent is legally punishable too. He lost his legal case for reinstatement and compensation. Actually Tunis in Tunisia at 37, Athens, Ankara. Cause and effect we need to debate, but we can all agree it has nothing to do with CO2. This NH freezing winter could be attributed to a cool sun. ‘With pressure/geopotential height anomalies predicted to remain positive across much of the Arctic and pressure/geopotential height anomalies predicted to remain negative across the NH mid-latitudes, the AO is likely to remain in negative territory into the foreseeable future. The floods in central Europe are due to rising sea levels which are due to global warming which is due to too much CO2 in the atmosFEAR which is due to too many coal fire stations. Haven’t you been reading Sydney Morning Hamas and watching their ABC? They are not good at predicting rain & inflows. Here is the outlook for this season from February. How wrong could it be? In 2013 they made the exact opposite error. They quite clearly don’t know enough to predict seasonal precipitation. Yeah we demand an audit, or at least an admission by BoM of abject failure to get seasonal forecasting correct. A new study is determining-or trying to,the effect of coral on precipitation levels.Could be GROUNDBREAKING!no links. Wow! Heat stressed coral convulses and releases DiMethyl Suphide. As the DMS molecules rise into the atmosphere, they are transformed into cloud seeding particles, and create low level clouds. When the particles have absorbed enough water, it rains … across the reef and over the farms and rainforests of North Queensland. The scientists are investigating whether the process could be creating a climate feedback system — where heat-stressed coral cause clouds and rain — which then cool the sea surface temperatures. So the pause in global warming can be blamed on mischievous corals? We need an international panel of scientists to study how to get corals to behave. The International Panel for Cooperative Corals ( IPCC ) will need funding, send half a billion now and the rest later. The post of Director is vacant…will Flannery apply? Sounds not dissimilar to what large pine forests do when heat stressed, though in that case it is volatile organic compounds (VOCs). Terpenes and isoprene are released. But that’s not all a German and French team found that isoprene was a significant player in weather and probably climate. This chemical is not only produced by living organisms (for instance plants and trees on land and plankton in the sea) as had previously been assumed. It is also produced in the “microlayer” at the top of the ocean by the action of sunlight on floating chemicals – no life being necessary. And it is produced in this way in very large amounts. Thanks AZ, I missed the link wording. As my comment is blocked. Try a search for isoprene clouds and cooling. You should find references to Atmospheric chemists from France and Germany, however, can now show that isoprene can also be formed without biological sources in the surface film of the oceans by sunlight and so explain the large discrepancy between field measurements and models. The new identified photochemical reaction is therefore important to improve the climate models. Global models at the moment assume total emissions of isoprene from all sources – trees, plants, plankton, the lot – of around 1.9 megatons per year. But, according to the new research, the newly discovered “abiotic” process releases as much as 3.5 megatons on its own – which “could explain the recent disagreements” between models and reality. These and other VOC cause atmospheric cooling and cloud seeding. Bringing weather extremes as they go. The poetry is closer to the truth than science. Weak solar wind (low magnetic activity of the Sun) increases the pressure over the polar circle. 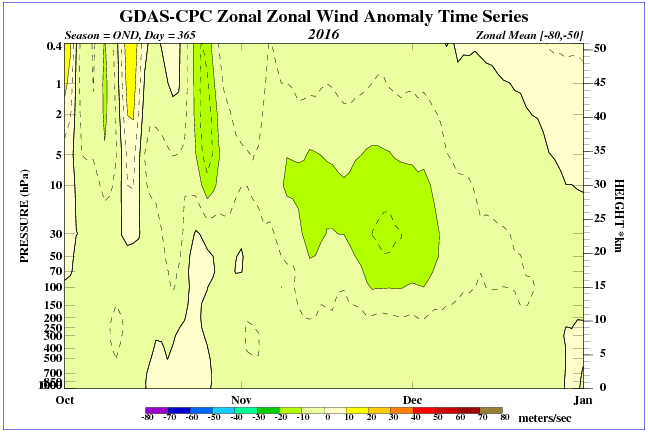 This causes a weakening of the zonal winds (pressure ridges inhibit wind) and the weakening of the polar vortex. There are of course average values. 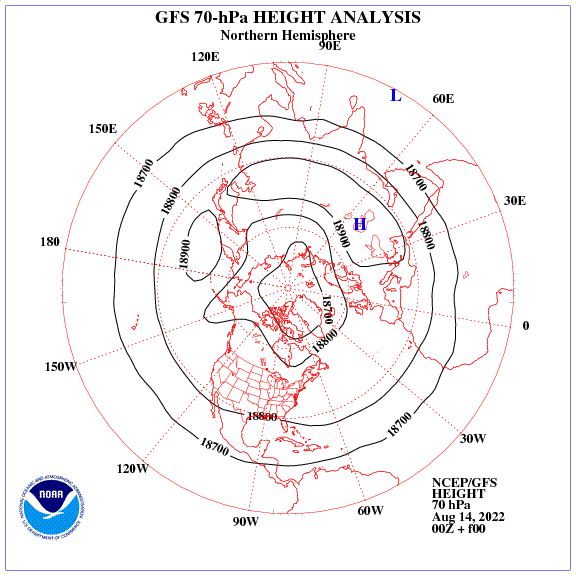 You have to see the distribution of pressure over the polar circle. Maybe we will see a return of witchcraft??? I have found an interesting correlation between global temperature and the price of Peter Wadham’s latest book titled “A Farewell to Ice”. “A Farewell to Ice is a report from the frontline of planetary change in the Arctic and Antarctic by a leading authority, presenting incontrovertible scientific data, but always in clear language which the layman can easily understand. It is one of the most important books published in recent years about the existential challenge which human civilization now faces. The publication is now available discounted by AUD23.19 to AUD26.80. By this correlation that makes it close to an even bet that the globe will cool before the Arctic is ice free again. If you are worried about the globe warming then now is a good time to snap up this important publication at a bargain price as the price will surely rise when things heat up. Interestingly Wadhams has been consistently reporting that the Arctic will be ice free within two years for the last six years. So he is at least consistent at getting it wrong. Wadham — not worth every penny he earns. Yes, but Leonardo Di Caprio, Vivienne Westwood and Naomi Klein, surely all noted climate scientists, just love him. When you are as famous as them you know everything about everything and can live in wonderful and righteous certitude. Why couldn’t Leonardo have gone down with the Titanic? His head is swollen enough to float the ship. He wouldn’t have said it if it wasn’t true. Yeah? Now let me see, if the sun stopped all of a sudden, the Climate scientist reckon we wouldn’t be affected and that the CO2 blanket will keep us warm? I’d like to discuss 1342 conditions with a climate scientist to see what the sun was up to at the time. But first I’d have to catch an actual climate scientist. If “climate scientists” weren’t so obsessed with a few molecules of a trace gas in the atmosphere and put us much effort into studying THE BIG PICTURE then we might get an answer to Jo’s “Oh for a mechanism” plea. Siliggy over at Jennifer’s blog came up with this observation. Geomagnetic modulation of clouds effects in the Southern Hemisphere Magnetic Anomaly through lower atmosphere cosmic ray effects. These may interest you too. Is this spot in WA real? Oops. it looks like the link in Jennifer’s paper to Griffith University does not work. All very interesting. Has anyone teased out an 11 year harmonic beat? No, I’ve been looking but there is too much noise. I am pleased to share this new report that solar energy, solar wind, solar neutrinos, and solar cosmic rays are all waste products from the pulsar-centered Sun. The Sun made all our elements and birthed the solar system five billion years (5 Ga) ago. The report that the Sun gravitationally holds planets in orbit and bathes them with waste products that sustained the origin and evolution of life on Earth was accepted for publication on 13 Oct 2016. The sloping error in the cornerstone of post-Modern Physics was published earlier this year in the three different journals or conference proceedings cited as (Manuel, 2016 a,b,d). No scientist or editor of any research journal can realistically claim to be unable to grasp the error in using a sloping baseline to define the nuclear energy that powers the Sun and the cosmos. _b.) Weak, long range attraction between the expanded (e-,p+) pairs (Hydrogen atoms) will then cause the universe to contract for the next cosmic breath. The cosmic cycle is recorded in the cyclic life of each of the electron-proton (e-,p+) pairs that comprise all matter in the universe. Your second link has absolutely nothing to do with what you’ve written – it’s a short, disorganised and highly speculative “cool story, bro!” about ideas that have been developed well beyond what the evidence supports. If you don’t like information in the second link, please just address evidence in the first link that Einstein (1905) recognized, Aston (1922) measured in atoms and reported what Weizsacker (1935) and Bethe Backer (1936) hid by using a sloping baseline to calculate: Nuclear energy that powers the Sun and the cosmos. Earth’s climate can’t possibly be independent of the Sun. Individual components of climate variations can be dependent on factors additional to, or other than, the Sun. Maybe this is the bit that has you confused? Virtually none of “our elements” were made by our Sun. A very, very small amount of matter on this planet was formed *partly* by our Sun emitting high energy particles that interacted with our non-Sun matter. How can you spend so much time dreaming up this stuff and yet make such a basic error? Precise experimental measurements had shown forty years ago that all of our elements were made in the Sun, as first publicly debated in the Jan 7, 1977 issue of Science. I’m sorry, but referencing more of your own fantastical literature is not useful here. In any case, does your article not talk about the creation of these elements during supernovae events, or inside stars prior to going supernova? b. has not gone supernova, or we’d have noticed. The Sun most certainly does not contain a “pulsar core” – this is an extraordinarily silly idea. We know the Sun’s size and its mass. We would definitely know it if part of the Sun comprised matter with a density exceeding normal matter density by a factor of over 10^9. Not only that, but a pulsar rotates incredibly quickly, and should have a good deal of iron around it. This would be easily detectable if it were occurring. 1. The density of nuclear matter is greater than that of normal atomic matter by ~10^15. 2. Also in 1977, Peter Toth reported precise measurements of the Sun’s regular pulse every two hours and 40 minutes (160 minutes). 3. Links to both of these 1977 papers are posted in some of the papers posted earlier. 1. As I said, over 10^9. Not all matter on a pulsar is pure nucleus. 2. This was an artifact of old observations. This cycle does not exist, and we’ve known this for the best part of 2 decades now. 3. Useless links to wrong papers from 1977 that have been proven wrong are useless. I’m not sure if you realised – those two are novels of fiction. The critical issue is that for jet stream behaviour to change it is first necessary to alter the gradient of tropopause height between equator and poles. 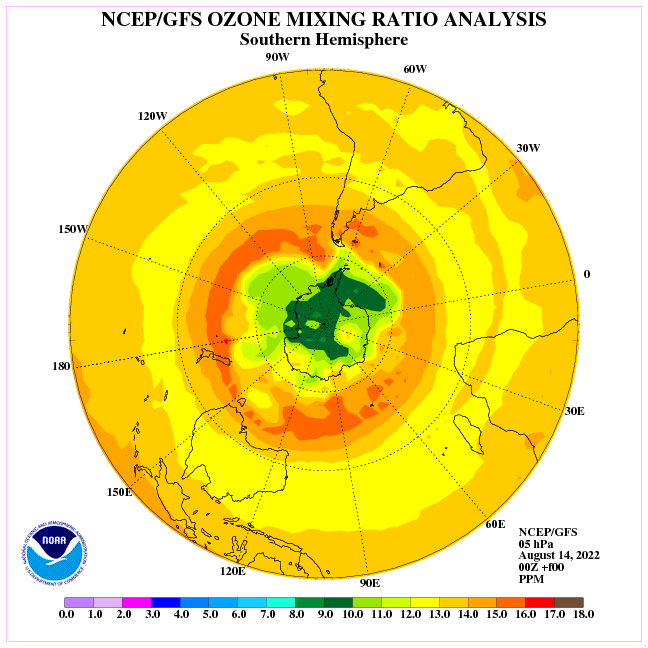 The sun’s effect on the ozone creation / destruction balance is the best candidate for that since it is ozone in the stratosphere that creates the tropopause. There have been suggestions that the ozone depletion over Antarctica in recent decades is responsible for the Southern Annular Mode being so positive. 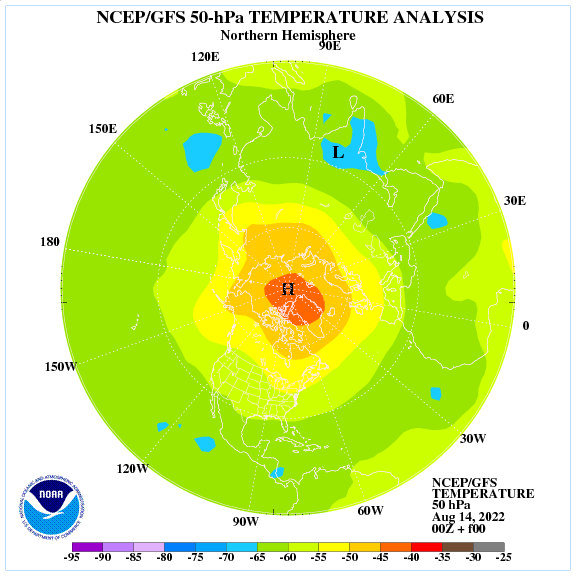 No better place to start reading about ozone, pressure, and vortex than here…. This distribution inhibits the wind zone. 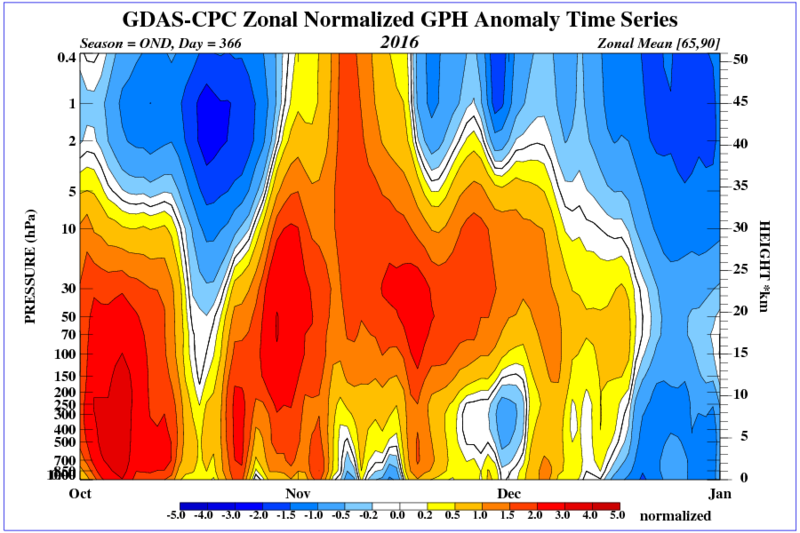 Compare the distribution of ozone with the magnetic field. OK, compared them. I can’t see the relationship. They say ozone concentration is affected by atmospheric flow patterns and by sunlight. Not by magnetic fields. If the premise is true, then the conclusion must be true that is we are at the dawn of an New Ice Age which could take full effect by the 2050′s or perhaps even earlier. Temperatures won’t fall very far, I remind people its like reliving the 1950s and 1960s, humanity can survive that. At this stage the unprecedented hiatus has the warmists in a pickle, but they are not giving up just yet. This NH winter is forecast to be brutal, so the hot money is on another white out in the UK. The LIA started around 1200 AD, to know what is coming we have to go back to the end of the Medieval Warm Period. It became cool and wet, ferocious wind storms and sea floods were part of the mix, nothing we can’t handle. When the Ulysses space craft was launch in 1998 it measured a solar wind to be 100%. In 2008 it measured solar wind pressure to be 70%, that’s a fall of 30% from 1998 and in that very same year NASA turned it off (this could been linked to political reasons, remember the email scandals??). In 2010 we saw cycle 24 this should end around 2019 and cycle 25 should begin around 2022? But if the solar wind pressure continues to trend downwards i.e, SWP potentially (2015 = 50%) and there may not be a solar cycle 25, we could see a rapid drop in temperatures around 2030 when the Solar wind pressure potentially hits zero. This is not forgetting that the Ulysses space craft also measured a measured increase in Galactic Cosmic Ray flux and a 30% reduction in the underlying magnetic field. But like you said we can handle anything nature, throws at us, which is the Sun in my view. However, time is of the essence something we can’t ill afford to lose. Ulysses was kept operational for 4 times its designed mission life. To get that 3rd 2008 solar scan, they started creatively switching components on and off to conserve power. It lost the ability to run several of its systems and eventually lost the ability to keep its fuel warm enough to stop it freezing, which means it was unable to orient its antenna to send data back. Ulysses provided 3 data points. All 3 showed similar solar wind speeds. The first two showed similar wind pressure, the 3rd showed a 25% reduction in pressure. From those 3 data points, NASA interprets that solar wind pressure is trending downwards. This would mean more cosmic rays from outside the solar system are reaching us. Why any of this would be “political” is a complete mystery. This study shows the usual phase problem back in early half of the 20th c.
Also Lean 2000 TSI is done by adding an 11 year running mean of SSN to SSN which is an odd thing to do and AFAIK Lean herself no longer supports this idea. There are significant mismatches with strong peaks in one record not occuring in the same cycle as strong peaks in the other. Just looking at the graphs shows the link is tenuous. The spectral analysis looks nice but they did a 5y running mean before doing it. This ensure notable attenuation between 5 and 10y and scrambles anything lower. There is a very strong 11y peak in SSN so even white or red noise will produce this in a cross-correlation. So the emergence of an 11y band is not surprising. The long record looks interesting but of course no data link, so finally not so interesting. 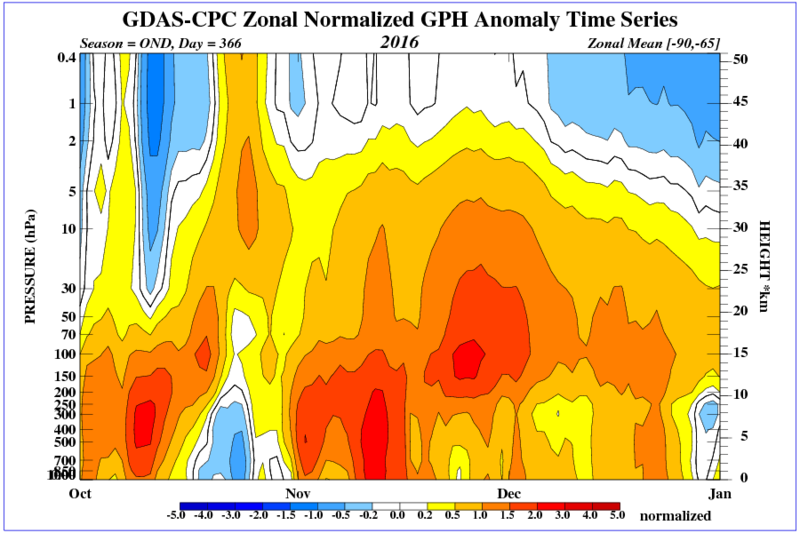 SST shows the same loose correlation with the same phase problems in early 20th c. so may match Ammer data better. It’s a bit confusing having their data plotted backwards and upside to the usual sense but SST has dip in the right place to match the spike in the middle of their graph. A major feature which does not correspond to changes in SSN/TSI proxy. For pity’s sake , that will just screw up the multi-decadal variability and introduce lots of false peaks and troughs. Do this the 20th c. data and you’ll get a pointy triangular wave. There does seems to be an interesting similarity but again no data, so all we have a fuzzy graph of data mangled by inept processing. Let me say once again: RUNNING MEANS MUST DIE. 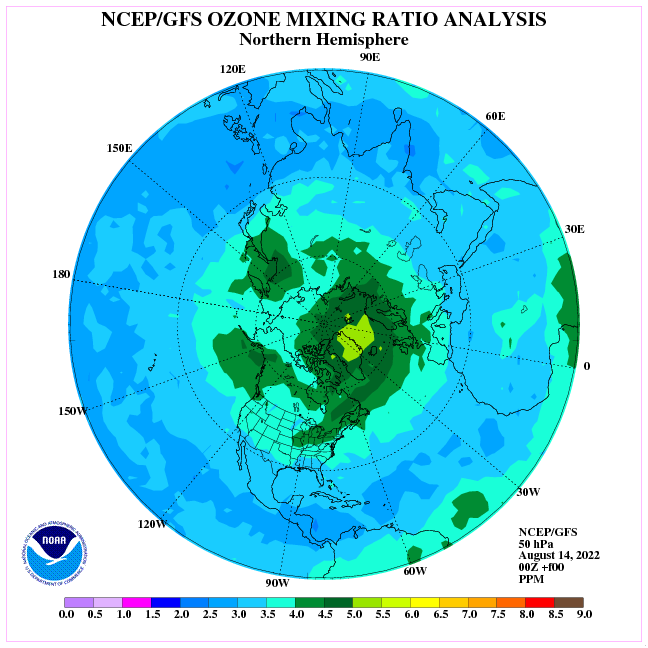 Pressure distribution in the stratosphere is modified by the decomposition of ozone. 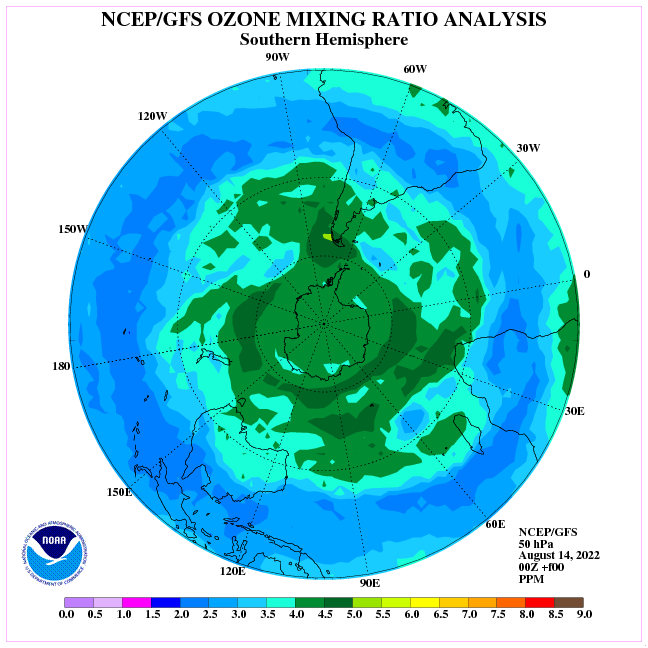 Distribution of ozone in the southern hemisphere in the stratosphere. The first graph here ( figure 2 from the paper ) shows a lagged correlation but superimposes zero, two and three year lags which has the effect of blurring the lack of correlation and the phase shift problems. It is still clear that there are problems in early 20th c.
However, comparing panel a and b of the graph it becomes clear that they “lagged” river data backwards in time. ( The x axis is mislabelled as “Age” but is in fact date ). So they find the greatest correlation when flooding PRECEDES TSI. This is contrary to what they explain in the method and while not totally impossible is not a good indication of causality. The also did yet another crappy running mean , this time 5y , which will INVERT the variability with a period around 3y. This paper has some serious flaws that should have been picked up in peer review.